Fatemeh Habibizad (a.k.a Gordafarid) The first female naqqal (storyteller) of Ferdowsi's Book of Kings, Gordafarid, has excelled in performing traditional narration of epic stories (naqqali) through thirteen years of research, meticulous collection of narratives, and patiently following the footsteps of old masters of this ancient dramatic art. Gordafarid has come a long way in challenging conventional social norms that consider naqqali as being an art form performed by men and for men in public places such as coffeehouses. Her perseverance and determination bore fruit when Morshed Torabi, the most famous naqqal in Iran, prized her with his own cane in recognition of her achievements. She has incorporated different styles of naqqali into a seamless and unique narrative style that is all her own. 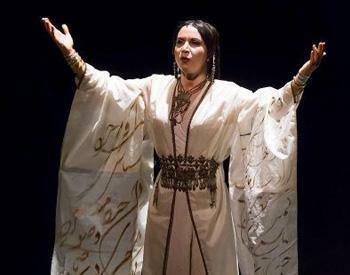 Gordafarid stunning capability in capturing the imagination of audience has drawn large crowds to her numerous performances both inside Iran and abroad. She has also published books and articles on naqqali and offered workshops and courses on the subject at schools and universities.